Grant funding from the LaFave Family Fund supports organizations that further education – particularly to promoting the humanities, the arts, tolerance and communication. Susann LaFave was a Bradford High School English teacher for over 35 years devoted to serving her students. Her interests included the arts (including which included acting in local productions) and traveling the world. 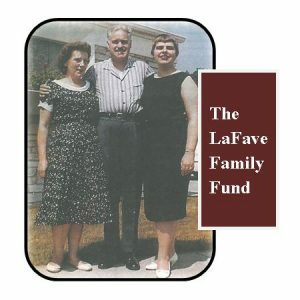 In addition to establishing an annual scholarship at her alma mater – Marquette University, income from the LaFave Family Funds provides grants to organizations that promote the interests and values that Ms. LaFave held. Pictured: Helen, Raymond and Susann LaFave.